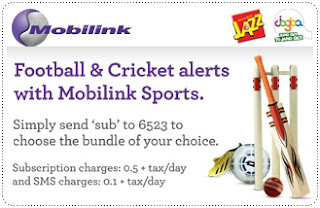 Mobilink has announced its latest value added service by bringing Sports Alert Service for Mobile Phone users. In alliance with sky sports, Mobilink now bring you all the information you need about cricket and football. Be it tournaments, leagues / clubs or a single matches, Mobilink bring you all the sporty, exciting news alerts that you are yearning for. Not only that, you can also follow the triumphant trails and fate inflicted downers of your favorite players all through Mobilink Sports. This service is available for all Mobilink customers including Jazz and Jazba subscribers. Send sub to 6523 or dial the IVR 6523 and select bundle of your choice. So get your fan gears on and move along with your favorite sports and sportsmen. For further details contact our customer care at 111 from your Mobilink number.